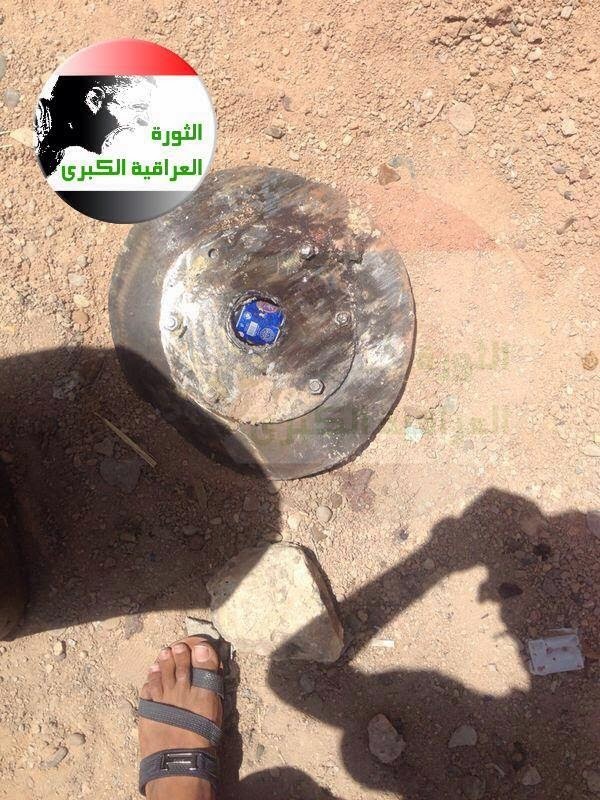 Brown Moses Blog: Is The Iraqi Air Force Using Improvised Barrel Bombs in Fallujah? 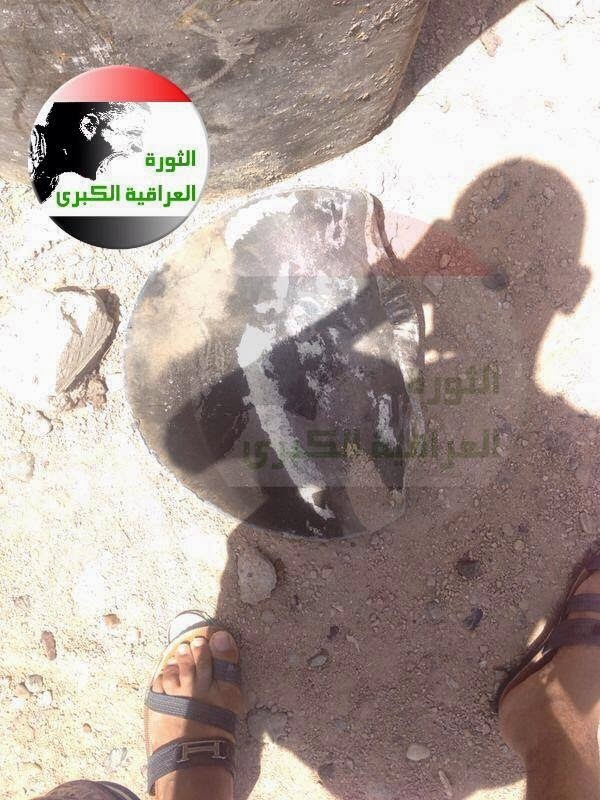 Is The Iraqi Air Force Using Improvised Barrel Bombs in Fallujah? This design doesn't match any known type of conventional bomb used by the Iraqi air force, nor does it match the design of the improvised barrel bombs in Syria. While improvised barrel bomb aren't unique to the Syrian conflict (Sudan being another example), considering the media and political furore over the use of improvised barrel bombs in Syria, it will be interesting to see the reaction from those same quarters if improvised barrel bombs can be proven to be have been used by the Iraqi military in Fallujah. Thanks to @me2455 for highlighting these images. 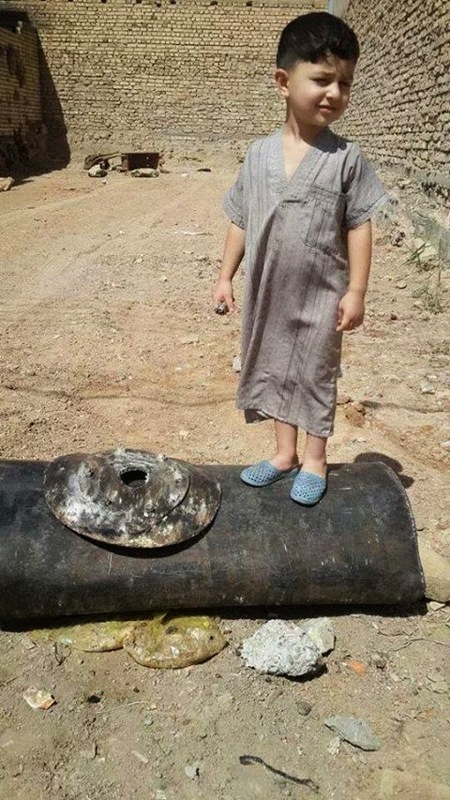 Update Thanks to @Azler00 for highlighting this Iraqi opposition Facebook page with more examples of improvised barrel bombs reportedly dropped by the Iraqi air force. I've collected all the videos I've found here. Public reaction will likely depend on what types of targets the Iraqis are using this type of weapon against. If they're dropping barrel bombs in large civilian populations then expect uproar. If they're dropping it on large, carefully selected insurgent targets (like enemy-held bridges, for example), then expect the reaction to be fairy muted. Well, the HE filler certainly looks familiar. My initial best guess is RDX + a small amount of Plasticizer (Diethylhexyl or Diocytl Seacate or Dioctyl Adipate ?) + a binder (Polyisobutylene ?) and a touch of motor oil?. Actually, Jody Wave, it's none of those ingredients. It's just codswoppers in the guise of junior high school science masquerading as incisive reportage. What baloney by a paid agent of the Qatari apes. Long live secular Syria and its magnificent Syrian Army. There are no mounting lugs - that wasn't dropped from a jet or helicopter's mounting points. 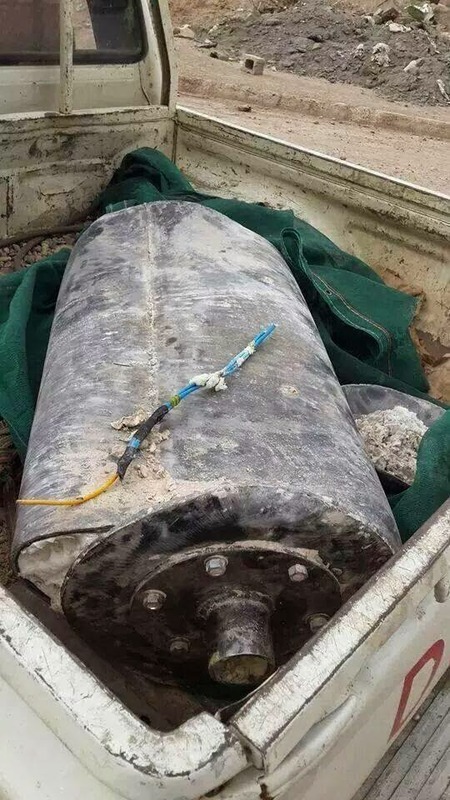 It looks pretty much like every other flying IED - either the motor tube doesn't extend into the body or it was mortar-launched and the tail piece broke or fell off. Al Maliki has been spending $10 billion a year on rearming Iraq for the Sunni genocide. They already have plenty of Mi-35's and Mi-28 gunships. Their AC-208 aircraft has missile mounting points and the U.S. has already delivered 100 Hellfire missiles (of 400) to them. The Iraqis are months away from getting their first shipment of F-16s and they have 140 M1A1 tanks. His army is not kicking barrels out of a helicopter. That only comes after the U.S. backs an al Qaeda-linked Sunni extremist uprising to overthrow the brutal dictatorship of al Maliki and shut down his regime's torture chambers. Kurdish or ISIL - take your pick. Jody: That would be the missing al Qa'qaa RDX or HMX - whatever hasn't already been used to kill American and Iraqi soldiers. A few hundred tons goes a long way. And diocytl-what? It's Iraq... Slack wax: close enough for head-choppers. If some poor terrorist's truck was in the back of the line in al Qa'qaa and they missed the good stuff, then they probably ended up with several hundred tons of hexamine and were forced to home-brew. Either that or they just loaded up at any of the dozens of other unreported depot lootings. The Iraqi's have severely limited options when it comes to air-to-ground weaponry, and until the arrival of F-16's the Syrian Air Force is still arguably far more lethal than the Iraqi Air Force, yet the Syrians still employ barrel bombs. The main capability the Iraqi Air Force currently lacks is an air-launched weapon capable of leveling large and/or fortified structures. You don't get that capability with standard helicopter armament. The Hellfire only has a 20 lb warhead, while barrel bombs being used in Syria are reported to contain over 1000 lbs of explosive. Considering the Iraqi's lack even a 500lb class air-to-ground weapon it doesn't surprise me in the slightest that they would be tempted to copy Syria and develop their own barrel bombs, especially considering that they also operate Mi-17's. The Iraqis are fending off suicide bombers, car bombs and hit-and-run attacks on their military posts. They don't need to level anything - they are not fighting a siege war in multi-story residential neighborhoods in every major city of Iraq. The situation is hardly anything like the current one in Syria. Would Maliki *like* a 500lb class air-to-ground weapon someday? Of course he does, but he needs aircraft that can carry them first. Does he need such a weapon this week? Probably not or we would have seen him leveling buildings *somewhere* with artillery by now. That's not happening. 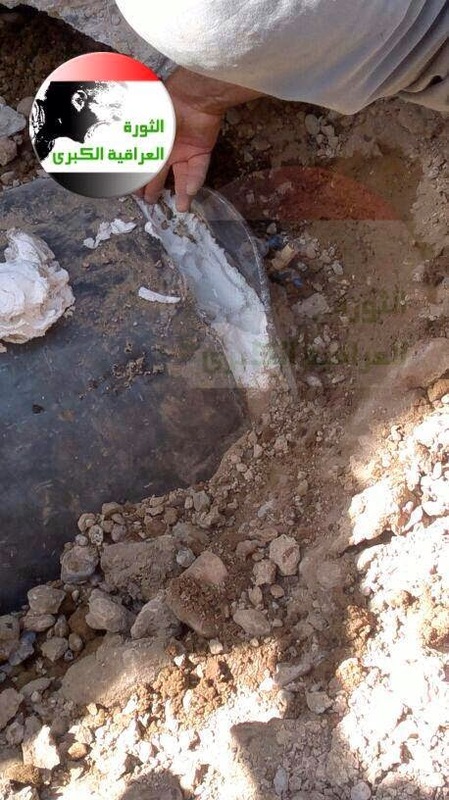 I would say the quantity of open source video and photos of barrel bombs that have been linked in the above article gives very strong credibility to the claim that they are indeed being used. Perhaps it is evidence that the situation on the ground is far more dire for the Iraqi forces than we have been lead to believe. 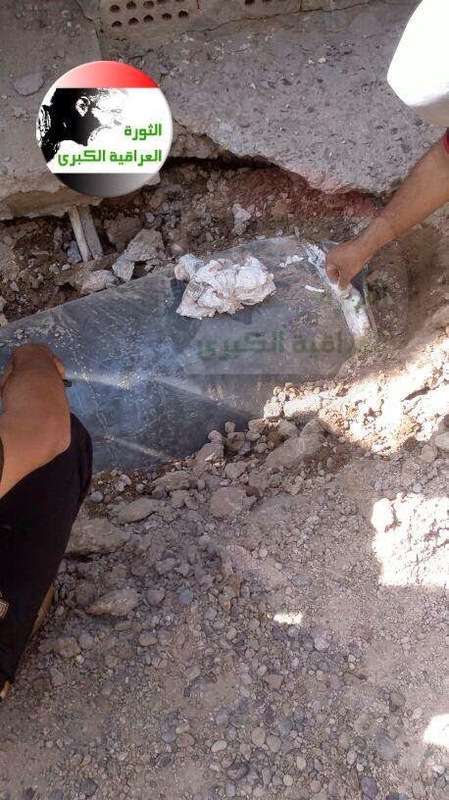 After reading this excellent article on Strifeblog, Considering that information, I have to agree that these are probably barrel bombs dropped by Iraqi helicopters. According to the author, Maliki *IS* fighting an Assad-style siege war against local insurgents in Fallujah. He just bombed their water and power utilities and I'm sure he would level the city if he has to. Helicopter-dropped barrel bombs would be a logical extension of that if he's trying to terrorize dug-in Fallujah insurgents and their families to give up or leave. I was under the impression that this was more of a hit-and-run battle around and *for* Fallujah. If that was the case, then ISIS sending mortar- or cannon-delivered bombs into Fallujah seemed more likely than Iraq cooking up their own version of helicopter-dropped barrel bombs. U.S. Lessons Learned: We probably shouldn't have killed a million Iraqis in order to replace Saddam Hussein with an equally psychopathic butcher - and then sell him F-16s and Abrams tanks. The attached article is old (one of way to many) but most likely this is the same explosive used in the bomb in the photos. During the last war in Iraq they (mostly Shia) used Iranian made C-4 to hand pack Iranian made EFP's and shaped charges. I would also not be surprised if these items (EFP's, shaped charges, and C-4 explosives) are today manufactured by the Iraqi Government. 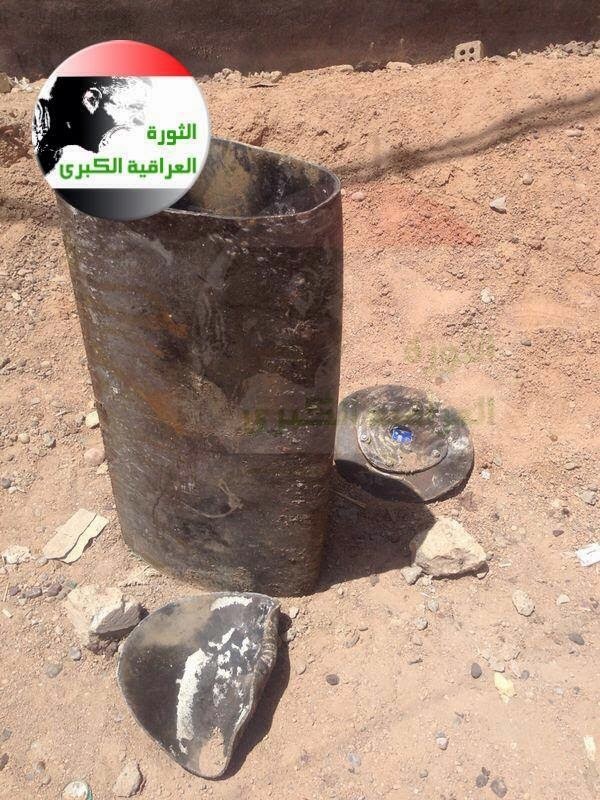 Also, Syria was manufacturing a similar RDX based, C-4 type explosive, at least as far back as 20 plus years ago. Excerpts from old article: "Quote" Iraqi troops uncovered a massive weapons cache and factory inside the northeastern neighborhood of Sadr City. The cache contained 34 of the deadly explosively formed penetrators, the weapons that are the hallmark of the Iranian-backed Shia militias. 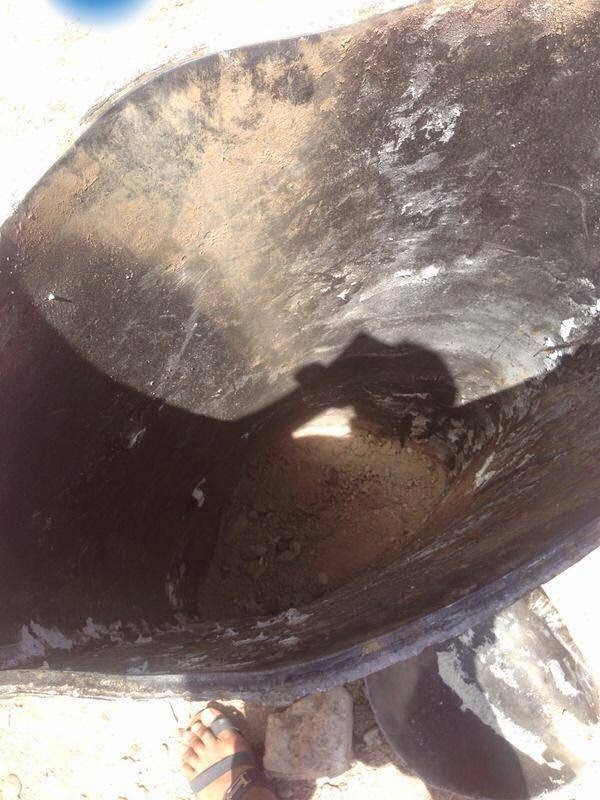 This is the third large cache found in Sadr City since Oct. 20. Also; The soldiers found 34 EFPs; 53 copper plates and 40 shaped plates, which are used for the EFP's/shaped warhead; 160 blocks of C4 explosives; and 14 107mm rockets and launch rails. Also found were three presses and a punch, machinery that is thought to be used to mill the copper plates into the cone-shaped warhead. "end Quote". The so-called "anti-government forces" AND the government forces are BOTH controlled by the U.S. ! This is a MASSIVE scam as Alex Jones has pointed out! By controlling both sides, a typical globalist scam, they can keep on attacking and re-attacking a given region. This is happening throughout the Middle East & Africa vis AFRICOM and Al-CIA-da.